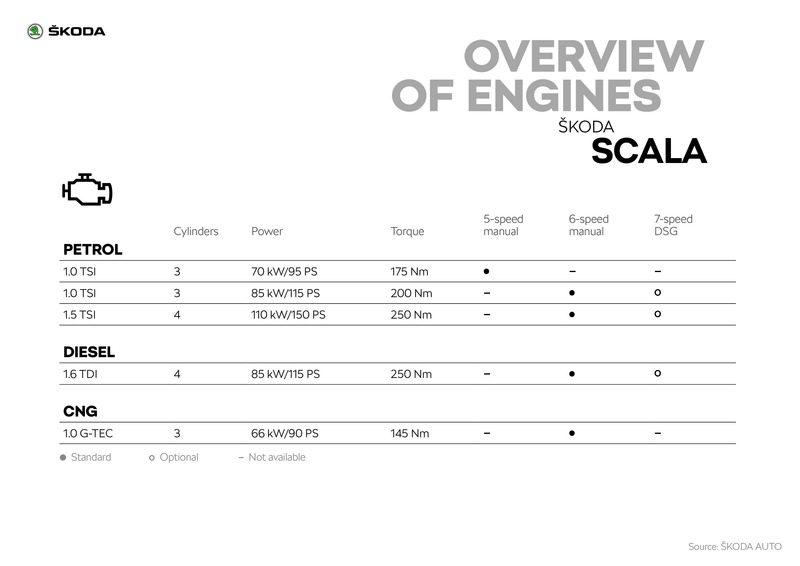 The new ŠKODA SCALA comes with a choice of five different engines. They all feature direct injection as well as a turbocharger and, of course, fulfil the Euro 6d-TEMP emissions standard. 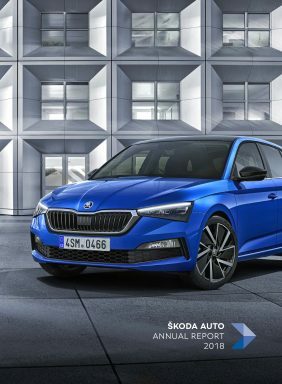 For the SCALA, ŠKODA is offering three petrol engines with a cylinder capacity of 1.0 or 1.5 litres as well as a 1.6-litre diesel. A 1.0 G-TEC that is designed to run on environmentally friendly natural gas (CNG) will follow later in 2019. All engines come with brake energy recovery and Stop/Start technology; the 1.5 TSI is also equipped with Active Cylinder Technology (ACT). 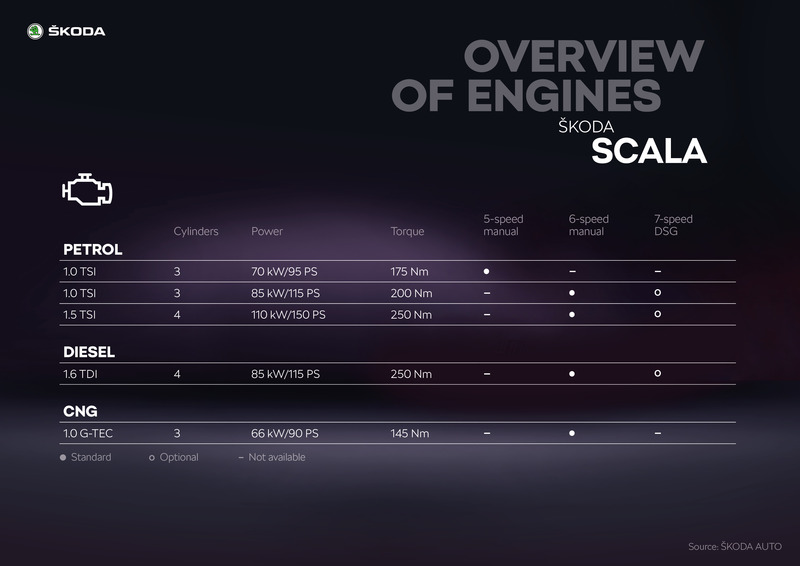 The top-of-the-range 1.5 TSI engine enables the ŠKODA SCALA to deliver 110 kW (150 PS) and achieve maximum torque of 250 Nm. This engine’s distinctive feature is its Active Cylinder Technology (ACT), which shuts down the two middle cylinders when engine load is low, thereby reducing fuel consumption. It does this automatically and virtually without the driver noticing. 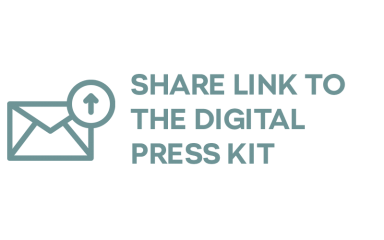 The four-cylinder engine is paired with a manual 6-speed gearbox as standard, but is available with a 7-speed DSG as an option. The two other petrol engines each have three cylinders and a 1.0-litre capacity. 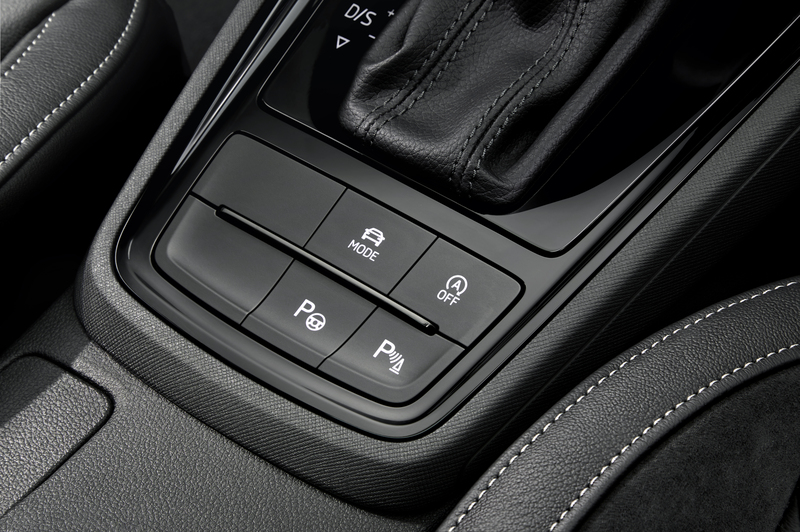 The power of the entry‑level 1.0 TSI, which produces 70 kW (95 PS), is transferred by a manual 5-speed gearbox. The 1.0 TSI with a power output of 85 kW (115 PS) comes with a manual 6-speed gearbox as standard, but can be fitted with an automatic 7-speed DSG as an option. All of the petrol engines are equipped with a petrol particulate filter. The four-cylinder 1.6 TDI has a power output of 85 kW (115 PS) and generates 250 Nm of torque. Fitted with an SCR catalytic converter with AdBlue injection and a diesel particulate filter as standard, it fulfils the Euro 6d-TEMP emissions standard. In this efficient diesel engine, a 6-speed manual gearbox as standard controls the traction; a 7-speed DSG is available as an option. 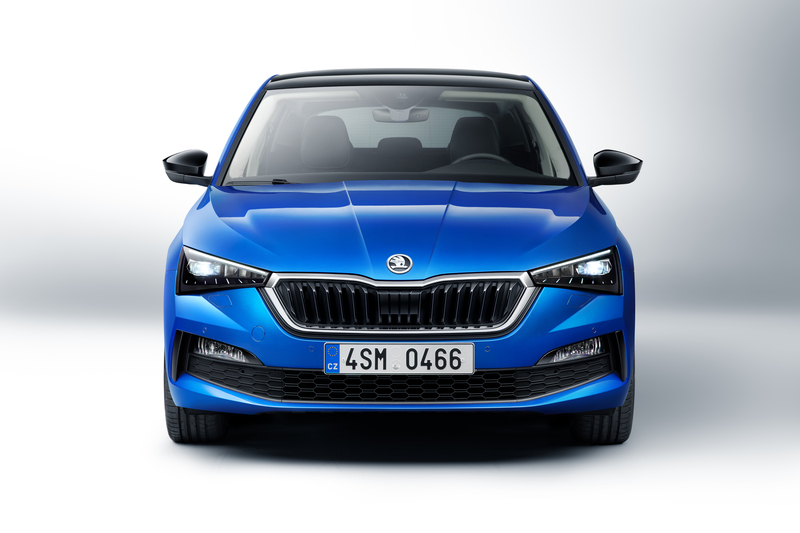 The 1.0 G-TEC, which delivers 66 kW (90 PS) and provides the most environmentally friendly way to drive the ŠKODA SCALA, will follow in 2019. With its standard chassis set-up, the new ŠKODA SCALA already exhibits safe and agile driving characteristics. However, customers can opt for the new Sport Chassis Control, which offers both customisation options and sportiness. The chassis is 15 mm lower and, in addition to Normal mode, has a Sport mode with firmer characteristics for the valve-reversible shock absorbers. This results in a sportier experience; the driver has a more intense connection to the road. Drivers can switch between the two chassis settings via the menu for Driving Mode Select, which comes in combination with Sport Chassis Control. Driving Mode Select also affects the responsiveness of the steering and engine as well as the transmission, and offers a choice of four modes: Normal, Sport, Eco and Individual.